From today’s Gospel: For as the lightning comes forth from the east and shines even to the west, so also will the coming of the Son of Man… And he will send forth his angels with a trumpet and a great sound, and they will gather His elect from the four winds, from one end of the heavens to the other. Literary critics are a prickly and opinionated group, but they have always agreed that one of the greatest works of Western Literature is Dante’s Divine Comedy, both as poetry and as human epic. Last year a human rights organization called Gherush 92, which acts as a consultant to the United Nations body on racism and discrimination called for the banning of Dante’s Divine Comedy, specifically the first part called the Inferno, from the classroom. Dante’s epic is “offensive and discriminatory” and has no place in a modern classroom, said Valentina Sereni, the group’s president. She went on to say: “we do not advocate censorship or the burning of books, but we would like it acknowledged , clearly and unambiguously, that in the Divine Comedy there is racist, Islamophobic and anti-Semitic content. Art cannot be above criticism”, said Miss Sereni. She goes on to say that school children who studied the work lack the “filters” to appreciate its historical context and were being fed a poisonous diet of anti-Semitism and racism. One could not ask for a better example of where post-modern Western culture is than this irrational screed from Signora Sereni. And for us here this morning we just heard the gospel for this Sunday which speaks of the Last Things, and speaks in graphically violent and unambiguous terms: that all of this will come to an end and an integral part of the end is judgment, judgment by God on every person who is part of, as we say, this world. 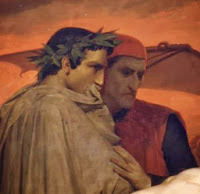 This business about banning the Commedia Divina is of existential interest to me, for I teach the Inferno in my senior class at my school along with the sixth book of Vergil’s Aeneid, both of which have to do with depictions of the Underworld, or, in impolite circles, Hell. The fact is, and this is what is relevant to Catholics, that Signora Sereni’s fears of students lacking filters to screen out the trash in the Inferno are quite unfounded. For the fact is that there are no filters to screen anything out. Or rather, the filters work very well indeed in a culture in which the individual and his wants are central to understanding anything at all. Most students, including Catholic students, would treat the Inferno as they would any literary composition of the Past, as if they were reading Paradise Lost, or Don Quixote, or Huckleberry Finn, or, better still, Alice in Wonderland. The very premise of the Inferno, that God’s justice demands the existence of Hell of which the denizens are tortured by various punishments for eternity, is incomprehensible to most students of today in Western culture, including those Catholics who have undergone the “rigors” of religious education in order to gain the prize of Confirmation. They are what concern us here today, but we cannot dismiss our concern for those who are the products of a denatured and de-Christianized Protestantism for which post-modern culture has effectively neutralized the sting of the Gospel. Where can one begin to address Signora Sereni’s difficulties with those in Dante’s Hell? With the lustful, with the heretics, with the blasphemers, with the sodomites, with the usurers, with the panderers, with the murderers, with those who betrayed their country and their friends, with Judas Iscariot, with Lucifer? There is nowhere to begin, for the decadent Western world in which we live will not tolerate judgment of any kind: except that judgment that is safe, the judgment that does not concern them. And so they revel in condemnation of corporate greed ( a bit close to the bone all too often in this part of the world), of the rich not caring enough about the poor, about the state of education for minorities, about the inequality of the sexes in the workplace, and so forth. But this condemnation is of the moment and of no personal moment. It has no eternal consequences. It is posturing, it is posing, for none of this relates to the judgment of God and the Last Things, over which they or we have any control. When one teaches the Inferno, one has a choice: to teach it as one of the greatest literary work of the Western canon and to comment on it as if one were commenting on an insect preserved in aspic, talking only about the beauty of the poetry, the sweep of history, the relationship to Classical literature, etc, etc. Or, while teaching all of the above, one points out Dante’s deep Catholic understanding of the essence of things: the natural law that is given by God, the presence and meaning of the Catholic Church in everyday life and in history, the terrible reality of sin and its consequences, the awe-ful justice of God, but also the harrowing of Hell and the reality of redemption in Jesus Christ and the mercy of purgatory and joy of heaven: all this, all this, but yet and also the reality of the horror of Hell that is the place forever of those who have rejected in an absolute way the offer of the mercy of God in the redemption made real by the Cross of Jesus Christ. The Divine Comedy, the journey to God, is the essence of the drama of what it means to be a man, a human being. It is not the base existential allure of Waiting for Godot. It is not the insane but plausible Superman of Nietzsche. It is not the debased sentimentality of contemporary belief that all is permissible as long as it hurts no one else. It is not the Catholicism that is reduced to the mawkish strains of “Let there be peace on earth” and “Eagles’ wings” against which the gates of Hell are more than a match. We have heard so much in the past year about the mercy of God, as if the mercy of God does not depend on the justice of God. Without justice there is no mercy. The mission of the Church is not primarily to proclaim the mercy of God. The mission of the Church is to proclaim Jesus Christ as Lord and Savior. The mercy of God is surely seen and exemplified once and for all in the Cross of Jesus Christ. There is no greater symbol of God’s mercy and love. Those silly “resurrected Christs” that are placed on a cross over an altar in some Catholic churches are a product of sentimentality and denial of the justice of God. And yet when one looks at the Cross one sees there the terrible, horrible, judgment of God on this world of sin, that God would have to have his Son die in this way: what does that say about this world, about you and me? The obvious answer is quite negative. But you see, the deepest answer to that question is Love, there is the answer. But not the cheap love the world would have us believe in, love defined as what I want to do, love defined apart from the laws of God, love defined so as to upturn reality into perversity, a false love that is doomed to hell, as Dante saw, as Christ told us, as St Paul wrote, that is doomed to death, for it is the opposite of Love. The gospel today speaks clearly of the second coming of Christ, a time of judgment, a time when the justice of God will be revealed and will be exacted. This will be a time, yes, a time of mercy on those sinners who have repented and who have believed in the Lord Jesus Christ as their Savior. And those will hear those words: “Come ye blessed of my Father…” But this will also be a time of justice, when the wicked who have not repented, who have reveled in their sinfulness, who have spit at the law of God, will receive their reward. And it will probably be much worse than anything Dante could have imagined.